Hey everyone! I'm back from an extended US vacation which kicked off in Orlando followed by a staycation in Disney World, stop over in Georgia, Kentucky and a road trip back to Chicago. Needless to say, we got more than a few things along the way leading to this post. I'll be publishing a series of haul by categories like makeup, skincare, gadget, stationery and miscellaneous. This way, you can just choose to read the categories that interest you. 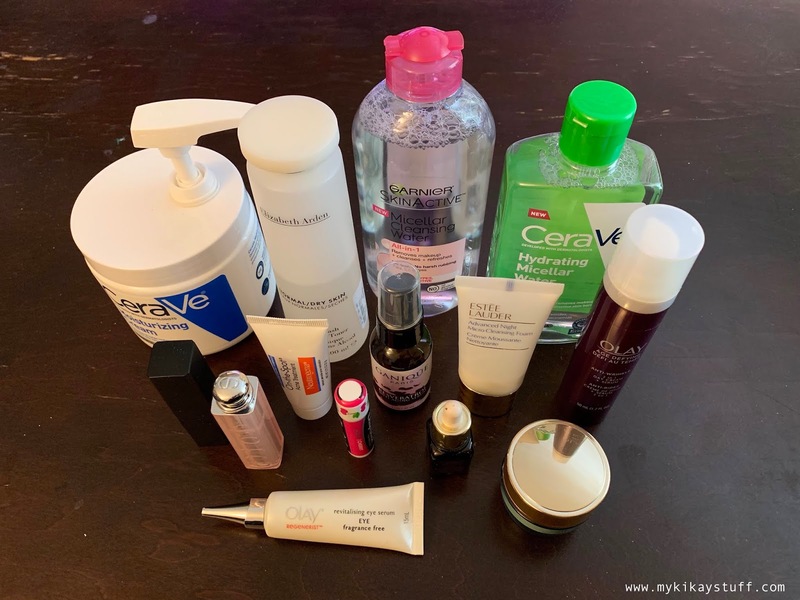 Let's start off with what I'm most interested in, skincare! CERAVE HYDRATING MICELLAR CLEANSING WATER. I got this for free during a convention in Orlando and the exhibitor said it's fairly new in the market. It comes in a generous 296 ml bottle and sells for about $8.99 in Target. CeraVe describes it as an ultra-gentle cleanser that removes makeup, hydrates and helps restore the protective skin barrier. ELIZABETH ARDEN HYDRA-SPLASH ALCOHOL-FREE TONER. I've always wanted to try other skincare products from Elizabeth Arden but the steep pricing always gets in the way. Good thing retailer shops like Marshalls carry brands that are reasonably priced like this toner. It comes in a 200 ml bottle and sold for $7.99 which is half its original price of $14. OLAY AGE DEFYING 2 IN 1 DAY CREAM + SERUM. How I wish we have this back home, a moisturizer and serum in one. It comes in a 50 ml bottle with a pump which is great for travel. I started using this already and I'll let you know how it goes in my future posts. GANIQUE PARIS RESVERATROL ANTI-AGING SERUM. Another bargain buy for me this time from TJMax is an anti-aging serum by Ganique Paris. Staying in the US during winter, I knew I had to amp up my skincare to battle dry skin. This serum comes in a 30 ml bottle with a pump and retails for $15. ESTEE LAUDER LIMITED EDITION DETOX + RENEW SKINCARE SET. This comes with 3 deluxe travel size products including a facial wash, serum and night cream. I bought the set directly from Estee Lauder's website during the holidays for $25. I'll be doing a separate post reviewing each product soon. The specific products included in the set are listed below. Advanced Night Micro Cleansing Foam 30ml. NightWear Plus Anti-Oxidant Night Detox Creme 15ml. ELF LIP EXFOLIATOR IN BROWN SUGAR. Another successful online purchase I made during Black Friday was a bunch of Elf products including their lip exfoliator. It comes in a lipstick tube housing 3 grams of the product. This retails for $3 but I got mine at half price off. CHAPSTICK CLASSIC CHERRY. Lip balms are a must in your stash during the cold climate which probably explains the massive variety of lip moisturizers in the US market. Each tube costs about a dollar but I got mine free from an online purchase. DIOR ADDICT LIP GLOW COLOR REVIVING LIP BALM. This iconic lip product has been on my wish list for ages! I finally snagged one from Duty Free during our layover in Texas. The Dior Lip Addict is nothing like any other gloss I know. It moisturizes my lips and gives a hint of color that flatters any skin tone. It's quite expensive though, priced at $34 each. CERAVE MOISTURIZING CREAM. I rarely use lotion back home but after seeing how dry my skin gets in cold weather I was left with no choice. Cerave has always been on my radar so I got one from one of our trips to the grocery for about $17. That's about everything! Thank you for reading this post and please explore the site before exiting to see more related entries. Please subscribe if you haven't by clicking the Bloglovin' icon on the sidebar to your right. Follow me on social media to get updated on future posts by ticking the tabs on the left upper corner of this page.